152 mm/55 OTO 19342 х 3 / 2 х 2 pcs. Initial HE Shell Velocity995 m./s. Initial AP Shell Velocity910 m./s. 100 mm /47 OTO 19284 х 2 pcs. 533 mm tubo lanciasiluri2 х 3 pcs. 37 mm/54 Breda 19324 х 2 pcs. 20 mm/65 Breda 19392 х 1 pcs. 20 mm/65 Breda 19354 х 2 pcs. 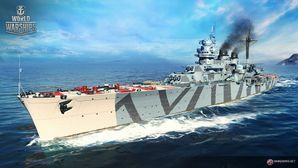 Duca degli Abruzzi — Italian premium Tier VII cruiser. The top and most powerful ship in a series of Italian Condottieri-class light cruisers. Unlike her predecessors, she boasted more powerful armament and significantly improved protection, but couldn't travel as fast. Duca degli Abruzzi was first released for sale worldwide on 4 May 2018. Duca degli Abruzzi is a fairly unique light cruiser at Tier VII, owing mainly to her assortment of consumables, including Repair Party ( ). In terms of firepower and overall play style she shares many similarities with her Tier VI Premium Italian cousin, Duca d'Aosta, so captains who are experienced in playing d'Aosta will feel right at home in Abruzzi. For main battery firepower, Duca degli Abruzzi features ten 152mm guns arranged in two sets of triple turrets and two sets of double turrets super-firing over the triples. On paper, this appears to be a large number of guns; however, in battle captains will quickly discover that her rear turrets have abysmal firing angles towards the front, requiring her to show significant amounts of her profile in order to get all her guns on target. Abruzzi is best played as a "kiter", angling away from the enemy and moving parallel to them in order to minimize her profile and maximize her armor thickness and guns-on-target. The guns themselves are fairly average in terms of AP and HE damage, but like d'Aosta, they suffer from a low fire chance; captains are encouraged to take the Inertia Fuse for HE Shells skill to improve her damage output, as relying on fire damage is not a viable strategy. Duca degli Abruzzi's maneuverability is excellent; a top speed of 35 knots allows her to get into and away from fights with relative ease, while a quick rudder shift time of 8.9 seconds allows her to wiggle out of the way of incoming fire. A turning radius of 680 meters leads to a decent ability to dodge torpedoes. Along with her maneuverability, Abruzzi’s concealment is very good as well. These two aspects of Abruzzi are her primary tools for staying alive in such a fragile ship. Captains should use her concealment and speed to get into good positions, and then kite the enemy from an unexpected direction, using her rudder shift to dodge incoming shells. If she is drawing too much attention to herself, she can fall back on her concealment and speed to get away, all while dropping her slow 12.0 km range torpedoes back at the advancing enemy. Abruzzi’s mix of consumables — including Repair Party ( ) — allows her to function as a decent fleet support vessel, while the ability to heal allows her to recover some of her fighting ability after engagements. It should be noted however that her heal will not make up for poor positioning and poor angling in combat, nor will it save her from disappearing in a single, well-placed battleship salvo. Captains must be exceptionally cautious in Duca degli Abruzzi when under fire from enemy battleships, or they'll have a quick trip back to port. Can mount the Repair Party ( ) consumable, allowing captains to recover some lost hit points during battle. Can mount Hydroacoustic Search ( ) and Defensive AA Fire ( ) simultaneously. Captains are also provided with the option to mount the Spotting Aircraft ( ) consumable in place of Defensive Fire. Her torpedoes have an impressive 12.0 km range, wide firing angles, and a short reload time. The ship’s high top speed of 35 knots helps her quickly escape unfavorable situations. Smaller surface detection range than many other cruisers at Tier VII. High explosive shell performance without Inertia Fuse for HE Shells is underwhelming. Armor-piercing shells have the worst penetration values of all Tier VII cruisers, and are largely ineffective at long range. Low fire chance of HE shells means that setting fires will be a rare occurrence. Citadel sits high in the water, making her highly vulnerable to large caliber shells. Even when using Defensive AA Fire ( ), her anti-aircraft armament is underwhelming, especially when facing higher tier opponents. Duca degli Abruzzi will struggle to perform well without a commander of at least 10 points. Her torpedoes are somewhat slow at 51 knots. As a Premium ship, Duca degli Abruzzi doesn't have any upgrades to research. Slot 1: Main Armaments Modification 1 ( ) will keep the guns and torpedoes active and firing. Slot 2: Either Steering Gears Modification 1 ( ) or Propulsion Modification 1 ( ) will help keep the rudder or engine up and running longer. Slot 3: Aiming Systems Modification 1 ( ) increases the accuracy of the guns and the traverse speed of the torpedo tubes. Slot 4: Propulsion Modification 2 ( ) provides for faster acceleration from stop to start. Key skills for Duca degli Abruzzi commanders include Priority Target, Superintendent, Demolition Expert, Inertia Fuse for High Explosive, and Concealment Expert. Priority Target is a basic skill for all ships, giving vital information on the enemy's targeting. Superintendent is useful for an extra use of Repair Party. Demolition Expert and Inertia Fuse for High Explosive are extremely vital in order for the Duca degli Abruzzi to do any decent damage. Concealment Expert is a crucial skill for all ships, especially the Duca degli Abruzzi, that enables the ship to better disengage from fights and to sneak around the battlefield undetected. As a Premium ship, Duca degli Abruzzi comes included with Type 10 camouflage that lowers her detection radius, reduces the accuracy of incoming shells, and increases the amount of experience she earns. Duca degli Abruzzi can technically make use of a significant number of the signals as she features torpedoes, secondary armament, and AA, but many of those signals provide little benefit. Players are much better off utilizing flags that boost consumable cooldown or her pitifully low fire chance. While Duca degli Abruzzi is a Premium ship, she is not much of a captain trainer as the Italian line does not feature a full tech tree yet. A friendly fighter appears on the scene to chase away enemy bombers. Main belt: 30mm outer belt + 100mm inner belt. 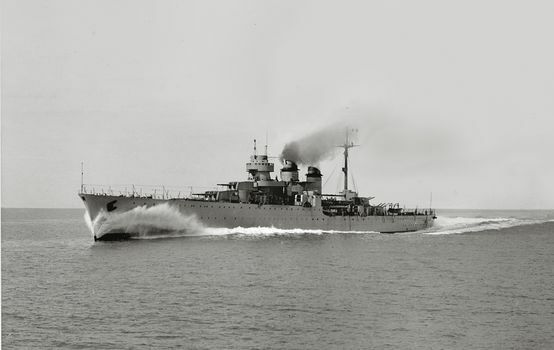 Duca degli Abruzzi at high speed, date and location unknown. The Abruzzi-class cruisers were considered the fifth and final subgroup of the Condottieri-class “family” of cruiser designs, incorporating the second major redesign and often considered the most balanced of all the cruisers of the class. Overall, the designers chose to reduce the speed and increase the size of the cruisers, while forfeiting agility for increased protection, stability, and armament. Abruzzi looks superficially similar to her cousins, with the most striking difference being the arrangement of the funnels; the increased beam allowed the two catapults to be placed off-center, so the funnels could be brought closer together. Internally, the armor scheme was similar to the previous designs with some noticeable improvements. For instance, the main belt consisted of two parts: a forward 30mm plate with a thicker 100mm slab placed some distance inside. The first layer was meant to detonate the fuses of incoming shells, while the latter plate was there to absorb fragmentation and further penetration. Additionally, the main deck was increased to 40mm, the control tower was increased to 70mm in some areas, and the exposed barbettes were increased to 100mm. Interestingly, the Abruzzi-class was one of the few ships that had armoring along the base of the funnels, most likely to avoid shell splinters entering the boiler compartments. The additional hull space meant that the class was able to carry eight boilers — two more than their predecessors — for further redundancy in machinery for safety. Feeding two geared turbines, the power plant generated close to 104,000 shaft horsepower. Although slower by two knots in comparison to the Duca d’Aosta-class, the ships still managed a respectable 34 knots in speed trials. Although the caliber of the armament was standardized to 152mm, the Abruzzi-class carried the longer 55 caliber guns as main armament; the ones first installed on the Littorio-class as secondary armament. Furthermore, the class increased the battery count from eight to ten rifles. These were organized as a pair of two-gun and three-gun turrets fore and aft; two-gun turret super-firing over the three-gun turret. Additionally there were 100mm AA guns organized around the superstructure, and a triple-torpedo launcher found on each side of the beam. Wartime modifications included replacing the 13.2mm AA guns for 20mm auto-cannons, and the installation of a radar set on a modified foremast over the forward superstructure. Cruiser Luigi di Savoia Duca Degli Abruzzi – named after the Prince Luigi Amedeo – was the lead ship of the Duca degli Abruzzi-class cruisers. She was laid down 28 December 1933 at shipyards in modern day Lerici, Italy. Launched on 21 April 1936, she was commissioned into the Regia Marina on 1 December 1937. Luigi di Savoia Duca Degli Abruzzi was commissioned into the Regia Marina the most advanced light cruiser in the Italian navy. On her trials in 1937, she achieved a speed of 34.78 knots at 103,991 shaft horsepower. Abruzzi and her sister-ship Giuseppe Garibaldi formed the 8th Squadron of the 1st Division. Her first missions were some of the last operations of the Spanish Civil War, participating in blockades of Republican Spanish shorelines, until the Nationalists won in April 1939. Following a visit to Portugal in later 1939, Abruzzi became the flagship of the 8th Division. When Italy declared war on France and Britain in 1940, Abruzzi and Garibaldi operated together frequently, eoyj their first major action being the indecisive Battle of Calabria against the British in mid-1940. Operating out of Taranto, Abruzzi remained on call throughout 1940, her only other major sortie ending up as a failed attempt to intercept troop convoys bound for Malta from Egypt. Come mid-March 1941, however, Abruzzi and Garibaldi moved to the Adriatic to cover convoy traffic involved in the Italian invasion of Greece. On 26 March 1941, both ships set out for a raid into Cretan waters, supported by heavy cruisers, destroyers, and battleship Vittorio Veneto. This raid turned into the Battle of Cape Matapan, where three Italian heavy cruisers were sunk at British-Australian hands; Abruzzi and Garibaldi had already detached from the raiding force before the battle, so they escaped a similar fate. The pair returned to their duties of intercepting convoys around the island of Malta and protecting Italian-German convoys bound for North Africa. Abruzzi split off from her sister, deploying in response to the British Operation "Halberd" in late September 1941. After resuming convoy protection operations, she took an air-dropped torpedo to the stern in the early morning of 22 November, blowing off her stern in its entirety. She limped back to port in Messina, where she remained for several months while undergoing repairs. As 1942 opened — and the pendulum in the Mediterranean began to swing against Italy and her Axis allies — Abruzzi, still missing her stern, had to quickly sail from Messina to Taranto, which was a safer port for her while her repairs were completed. Re-joining Garibaldi, the two cruisers transferred to Pilos, Greece in July 1942 to attempt to intercept British attacks on convoys, but shortages of fuel, bombing attacks, and the lack of enemy naval activity forced their withdrawal to Taranto by November that year. The severe shortage of fuel in Italy eventually left both ships permanently in port at La Spezia. Following the Italian Armistice, both ships surrendered at Malta in September 1943 and were transferred to the Central Atlantic, settling at their new base of Freetown, Sierra Leone, where they escorted Allied convoys through the Atlantic. Abruzzi returned to Taranto on 29 April 1944, operating thereafter as a transport and training ship. After World War II, she had a long career in the reformed Marina Militare, going through several rounds of modernization, and equipped with various experimental equipment designed for future Italian vessels. Duca degli Abruzzi was decommissioned in 1961 but remained a hulk in Venezia until she was scrapped in 1972. Duca degli Abruzzi during sea trials, circa 1938. Giuseppe Garibaldi, sister ship of Duca degli Abruzzi, heads to sea. Garibaldi underway, location unknown, circa 1938. Sketch of her sister ship, Giuseppe Garibaldi. US Office of Naval Intelligence recognition drawing of an Abruzzi-class cruiser. Abruzzi during a formal visit to Malta, 23 July 1955. This page was last modified on 7 May 2018, at 20:38. This page has been accessed 51,373 times.